The Renault Captur (left) was Europe's top-selling small SUV/crossover in the first half with almost 108,000 sales. 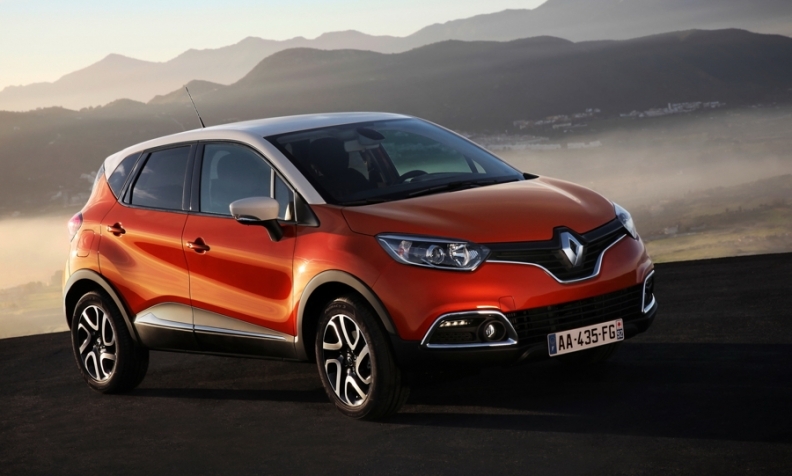 The Captur's success comes after the Renault Modus flopped in the small minivan segment. One clear trend emerged from Europe’s six-month vehicle sales: Torrid demand for SUVs and crossovers is putting increased pressure on minivans. Overall first-half sales of people movers decreased 13 percent in the first half to 582,000 units from 657,000 in the same period last year. The Opel/Vauxhall Meriva, Volkswagen Touran and Citroen C3 Picasso were among Europe’s former hot-sellers that were hit by declining sales in the first half (for a look at all the segment winners, click on the PDF above). Meanwhile, combined sales of SUVs and crossovers ranging from the Renault Captur to the Nissan Qashqai to the Audi Q3 increased 18 percent in the first half to almost 1.6 million units (see table, below). That means more than 21 percent of car buyers in Europe chose an SUV or crossover in the first half, up from 20 percent last year and 17 percent in 2013. 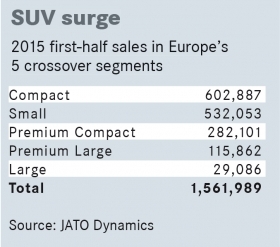 Another first-half highlight was that all five of the SUV/crossover segments monitored by Automotive News Europe, using data from JATO Dynamics, grew more than the overall market. Renault’s decision to abandon Europe’s small minivan segment in favor of the subcompact SUV sector epitomizes how dramatic the market shift has been. Renault is credited with creating the minivan segment in Europe, starting with the midsize Espace, followed by the compact Scenic and ending with the subcompact Modus. But instead of replacing the Modus, which was a weak-seller in its segment, Renault decided to enter the small crossover segment with the Captur, which has risen to No. 1 in its class. Another sign of the changing times is that Renault transformed the once big and boxy Espace into a sleek crossover-like vehicle when it debuted the new generation of the minivan last year. Espace sales were up 61 percent during the half in a segment that declined by 11 percent. “My view is that the market is changing because of changing customer tastes and automakers have to adapt,” Renault Chief Competitive Officer Thierry Bollore told Automotive News Europe. Looking at Europe as a whole, vehicle sales surpassed analyst expectations by growing by 7.8 percent to 7.34 million units in the first half as 13 of the 24 segments tracked by Automotive News Europe grew faster than the overall market and four other segments experienced year-on-year increases. Just seven segments declined in the half (see table, below). Europe’s fastest-growing segment was electric cars, with a 57 percent rise to 43,023 units, but the niche’s overall value remains muted as EVs had a combined first-half European market share of 0.58 percent, up from 0.47 percent last year. The Nissan Leaf was No. 1 followed by the Renault Zoe with the Tesla Model S rounding out the top three. The battle for the title of Europe’s largest segment is heating up. Subcompacts remained No. 1 with sales up by 6.3 percent to 1.48 million in the first half, while compacts grew by 9.9 percent to 1.34 million. That means the gap between the two segments shrank to 140,000 units in the half compared with 173,000 during the same period a year ago.